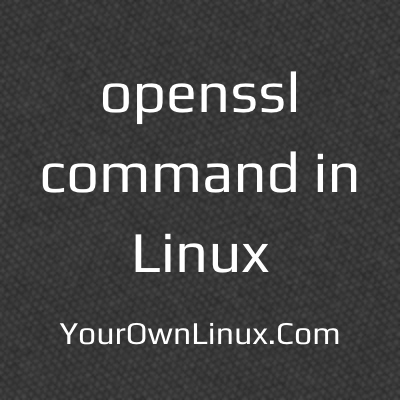 openssl Command in Linux ~ Your Own Linux..! In the earlier days, when people started to use the Internet, information was being transferred across the globe through HTTP (Hyper Text Transfer Protocol). HTTP was never safe as the information was being transferred in the plain text format and clould easily be available to the hacker who would intercept the communication. This information may consist of sensitive information including credit card details and passwords, which lead to increasing frauds. Hence, it was necessary to pass this information from one corner of the world to another through a secure channel, such that the information is not compromised. Thus, encryption came into the picture and the protocol that uses encryption while using HTTP - Secure Socket Layer (SSL). 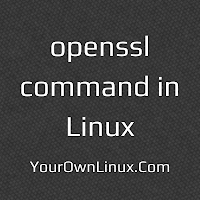 Since then, it is popularly known as HTTP over SSL or HTTPS. Authenticity - HTTPS ensures that, the data exchange is happening with legitimate user, i.e. it checks the authenticity of the enduser it is connected to. If it is an intruder, it will drop the connection before any data exchange happens. Data privacy - HTTPS encrypts the data such that only the intended enduser can decrypt and read it. Intruders will only be able to capture the encrypted message that is not readable. Data Integrity - HTTPS ensures that the data received at receiver end is the same one which was sent at sender end, i.e. it has not changed/altered in the middle. It will create a file example.key which is the private key. Lets look at the contents of this file. This will generate a file example.pem whose contents are the same as that of example.crt. So, effectively it just copying the exmaple.crt file as example.pem. This generates a key example2.key from the p12 file.